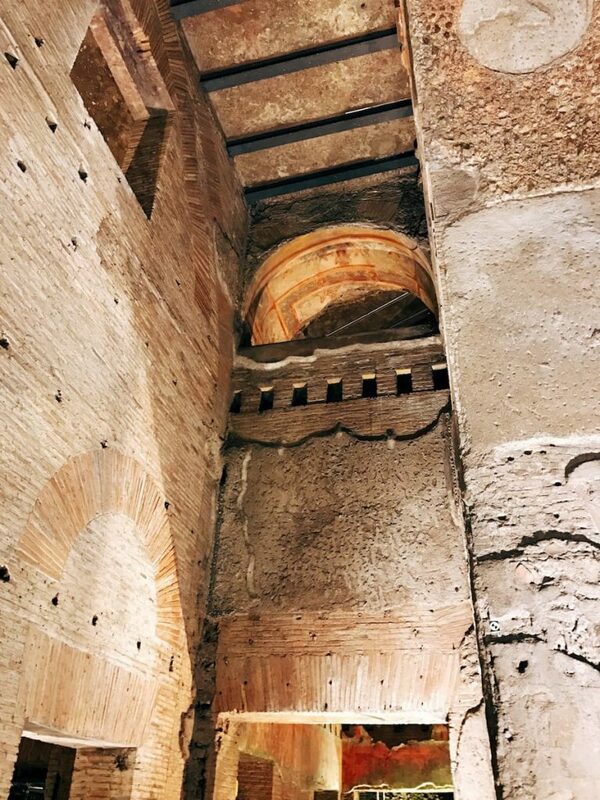 Entrance to the Domus Aurea, Rome. The majestic remains of the Domus Aurea, the legendary “golden house” desired by emperor Nero, are a fragile and hidden treasure survived from Ancient Rome. Involved in a remarkable restoration project, the part of the monument left on the Oppian Hill is closed since 2006 and it’s currently accessible only on the occasion of this series of extraordinary guided tours, which will let you immerse yourself in an enchanting play of shadows and colors dancing on the old walls of those underground spaces. Notice: many thanks to our friends at Through Eternity for inviting us to take part in this visit. Ninfeo di Ulisse e Polifemo, 1st century AD, Domus Aurea, Rome. The Domus Aurea was the urban villa commissioned by emperor Nero after the great fire of Rome in 64 AD, which destroyed a considerable part of the urban center and affected his first imperial residence on the Palatine Hill. 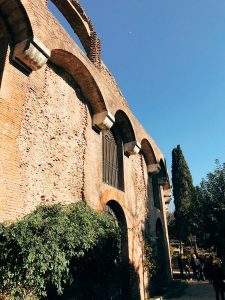 The sumptuous villa covered a huge area of about 80 hectares, extending on the slopes of the Palatine Hill, Oppian hill, part of the Caelian Hill and Esquiline Hill. This opulent residence was profusely adorned with refined materials such as marbles, gems, shells and precious artworks, like sculptures, mural paintings, mosaics and other gilded stucco decorations. The architectural complex was spaced out on green and luxuriant spaces, including vineyards, grazing lands, gardens, woods and an artificial lake. A side of the villa was opened through a long colonnade, oriented towards the South to benefit the most from the sunshine, so that the play of lights brightened up the interiors and accentuated the preciousness of the decorations. 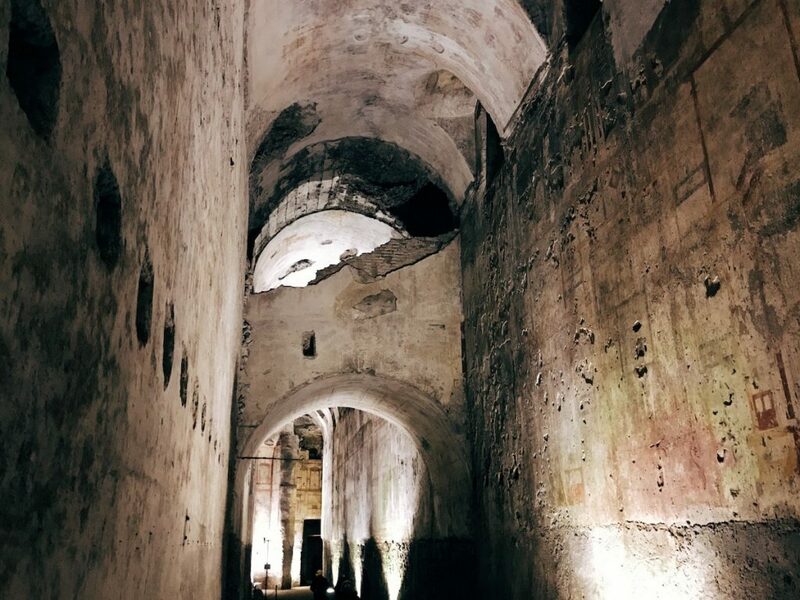 Sala di Achille a Sciro (119), 1st century AD, Domus Aurea, Rome. Grande Criptoportico (92), 1st century AD, Domus Aurea, Rome. Info on the restoration project. 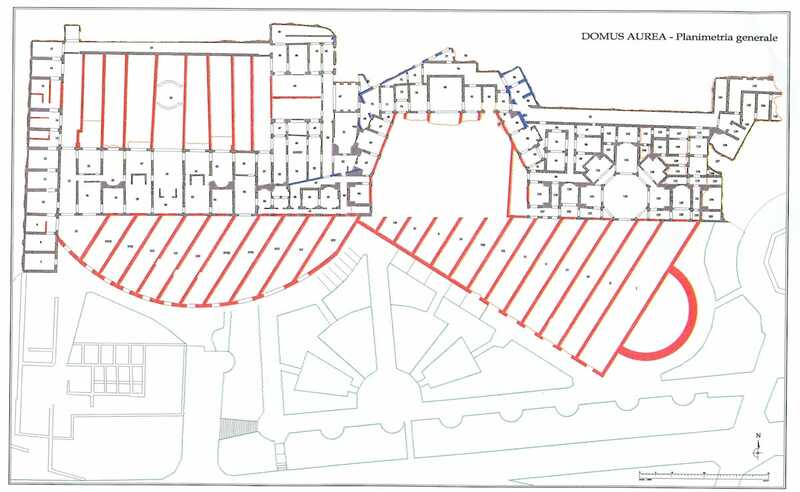 Domus Aurea plan, via Archivio SSBAR. 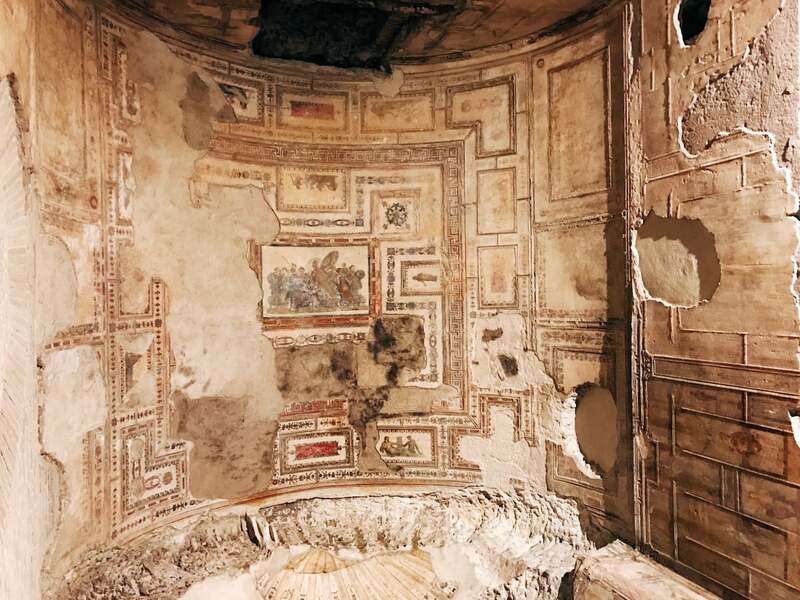 Ambiente 42, 1st century AD, Domus Aurea, Rome. 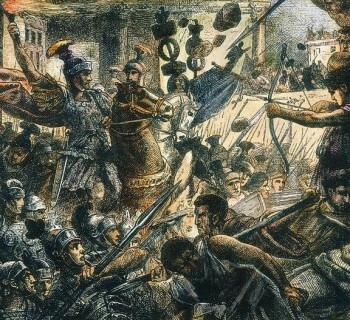 After emperor Nero’s death in 68 AD, the residence was ruined by a fire in 104 AD. Following emperors preferred to return the territory to the citizens of Rome, so the Colosseum was built in place of the artificial lake and the Baths of Titus and the Baths of Trajan (Thermae Titi and Thermae Traiani) were later built above the structures of the Domus Aurea (at the base of the Esquiline Hill and on the Oppian Hill, respectively), so they were partly destroyed, altered or buried and survived underground until the “discovery” during the Renaissance. 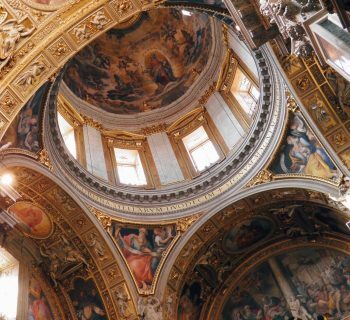 Artists such as Raphael and humanists climbed down into the rooms of the complex, closely resembling gloomy caves, to admire the remains of the marvelous frescoes by candlelight and they left inscriptions on the walls as a sign of their passage. 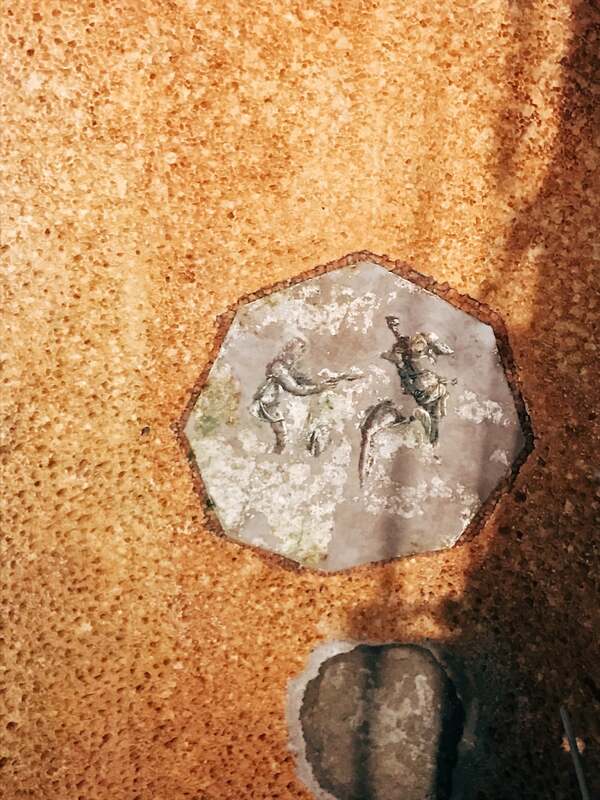 Thanks to the elegance and the lively creativity that characterized the Roman originals, those paintings became the highest source of inspiration for the mural decorations throughout the Renaissance, which were called “grottesche” (deriving from “grotte”, the Italian word for “grottoes”). 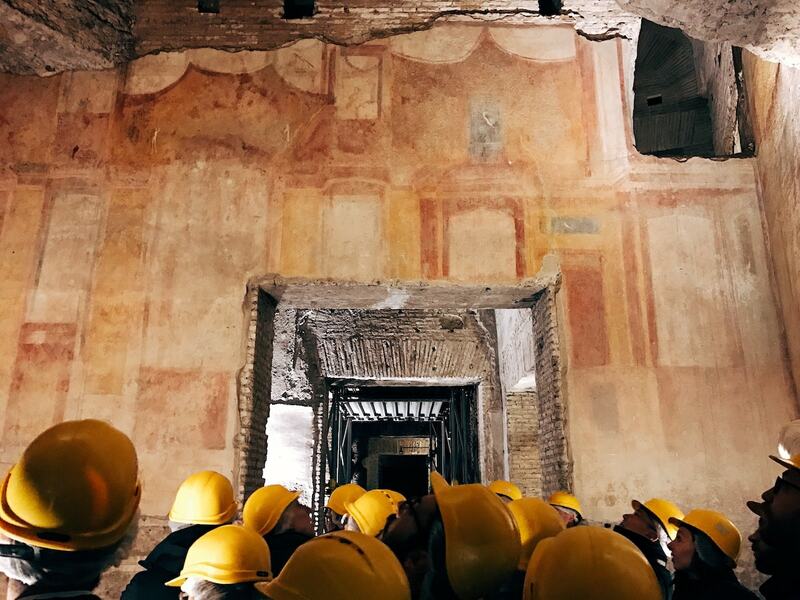 The Domus Aurea survived as the meaningful, extreme and legendary example of the Roman art and architecture mastery in the history of Italian culture. 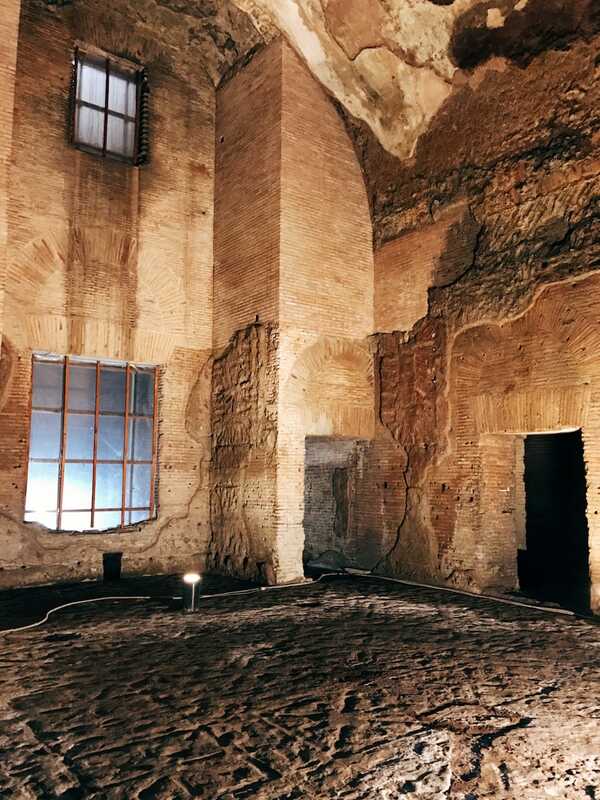 Sala della Volta delle Civette (29), 1st century AD, Domus Aurea, Rome. The exploration starts from one of the later Trajan’s diagonal galleries and then twists and turns through several rooms such as the Cortile Pentagonale, Grande Criptoportico, Sala di Achille a Sciro, Sala della Volta Dorata, Sala della Volta Rossa, Sala della Volta Gialla, Sala della Volta delle Civette and the large octagonal room located between the two pentagonal courtyards, which space out the two sectors constituting the main core of the Domus Aurea. This room has been uncertainly identified with the octagonal room described by literary sources. According to Svetonius, for example, that room ("coenatio rotunda") was the majestic venue for banquets and opulent feasts, celebrated under its pavilion vault constantly “revolving day and night as the Earth” to enjoy the breathtaking panorama. Still now, silently standing at the center of this wide and bare room flooded by the white light coming from the upper big oculus is an unspeakable emotion. 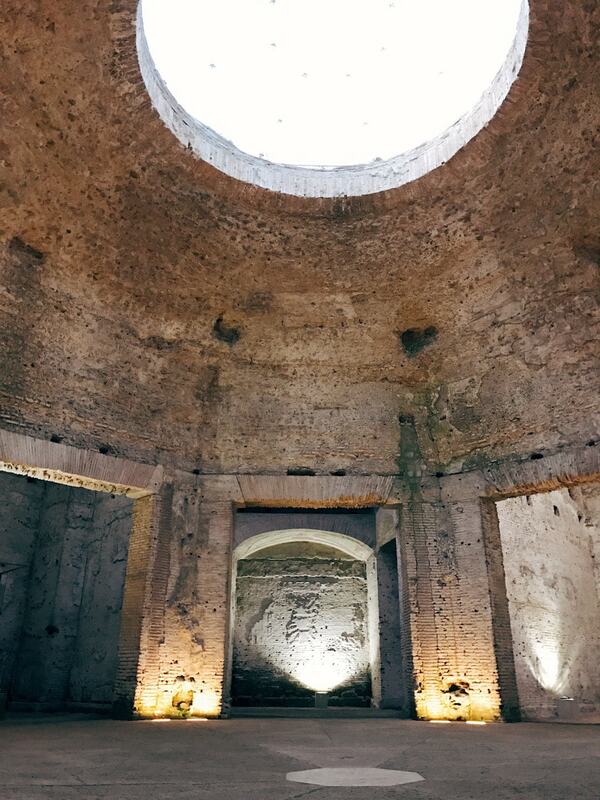 Octagonal room, 1st century AD, Domus Aurea, Rome. Detail of a window, Grande Criptoportico (92), 1st century AD, Domus Aurea, Rome. 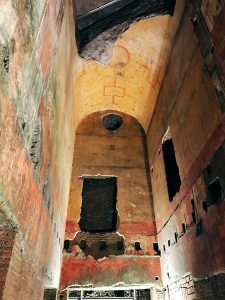 Interior passageway, 1st century AD, Domus Aurea, Rome. 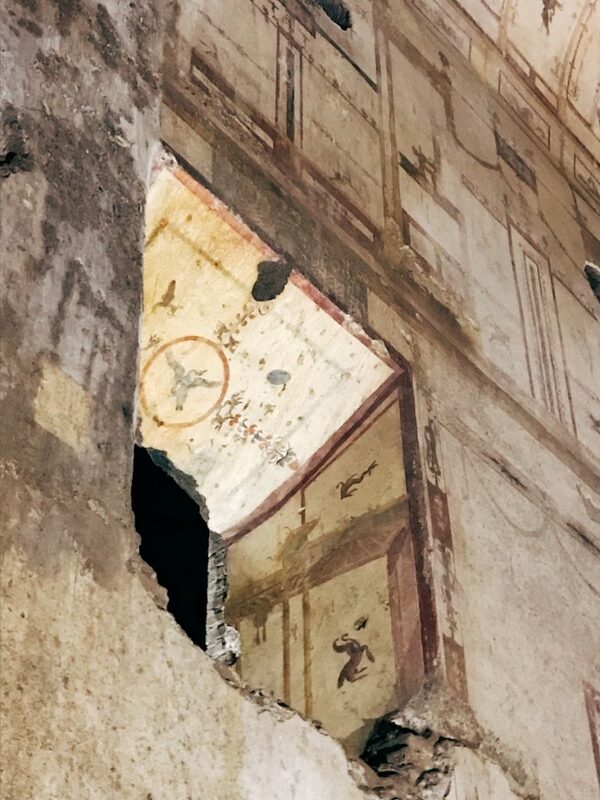 Mural paintings, 1st century AD, Domus Aurea, Rome. 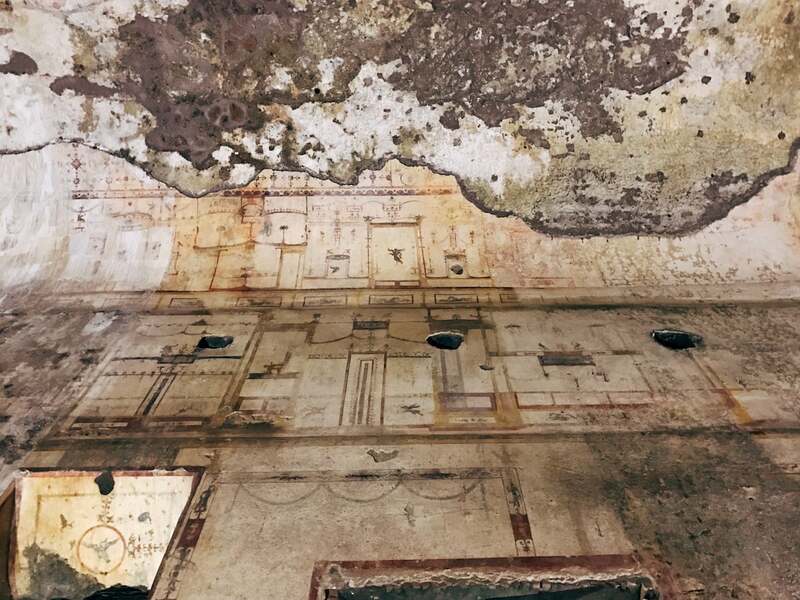 Ambiente 41, 1st century AD, Domus Aurea, Rome. The Soprintendenza developed a noteworthy restoration project for the “Domus Aurea Park” on the Oppian Hill following the recommendations by the Committees for Archaeological Heritage and Architectural and Landscape Heritage originated from a joint meeting in 2011. 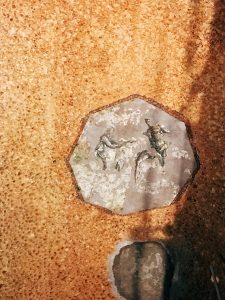 Currently ongoing through studies and test phases, the project is aimed at uncovering the ancient structures still to be excavated, consolidating the surfaces and restoring the decorations of the monument. 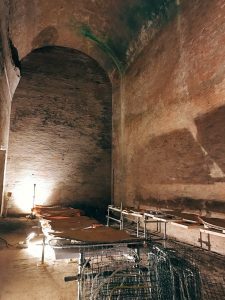 Protection and monitoring systems are intended to be installed in order to control as well as maintain an optimal level and constancy of humidity values and rehabilitate the area above the Domus Aurea. According to the public statement, a new sustainable park for the conservation of the remains is going to be created, recovering and visually integrating the perception of the older underground structures with the upper and more recent remains belonging to the Baths of Trajan.